Picture rolling countryside coated in a blanket of white, tiny snowflakes dancing past the window of the stately home you’ve exclusively hired. Inside, the fire is crackling and the room is aglow. You wrap your hands around a steaming mug of mulled wine and cosy up with your partner by the hearth. Winter weddings are truly magical and if you’ve decided that they’re for you, here are our favourite winter wedding venues in the UK that you should arrange to visit immediately, if not sooner. Find your ideal winter venue with Bridebook’s wedding venue search! 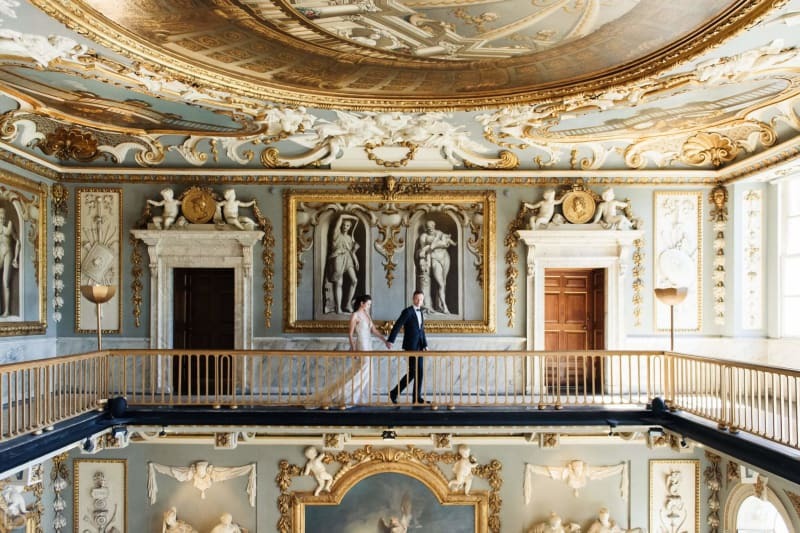 Holkham Hall is one of the most magnificent wedding venues in the country. As you approach it, frosty parkland and frozen lakes only make Holkham Hall’s grand yet cosy interior seem all the more inviting. Weddings can be held in any four of the staterooms within the Hall which are magnificently decorated for the winter months, or in the newly refurbished Lady Elizabeth Wing. The Marble Hall is an incredible wedding space with huge vaulted ceilings and marble pillars which have been inspired by the Pantheon in Rome. Add a little festive sparkle, and you’ve just created a winter wedding to remember. For an extremely classy winter wedding with a wow factor, Moor Park Mansion is the winter wedding venue for you. Impress your guests as they walk into this incredibly grand 17th-century mansion. As you step inside, expect to find gold-leafed ceilings, enormous original paintings and open fireplaces twinkling with Christmas lights and draped with wreaths. It will take your breath away! 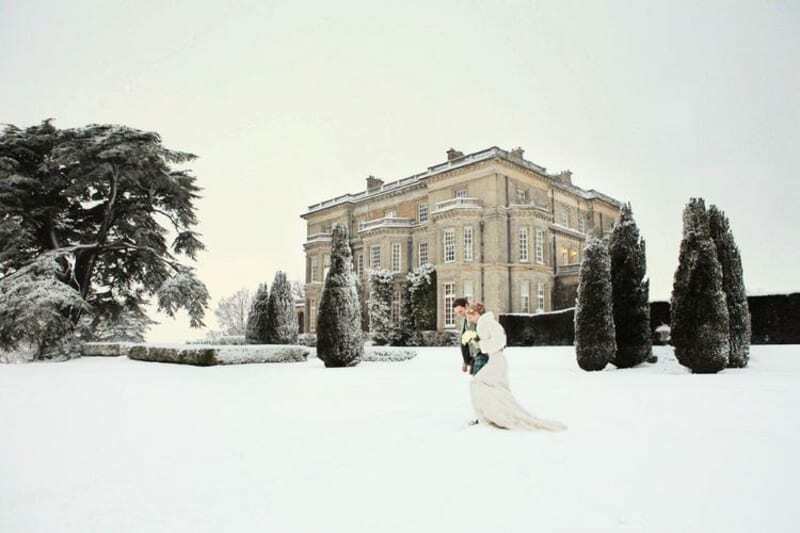 Hedsor House is an absolute dream for lovers of winter country house weddings. The crisp, cold weather will make for stunning photographs both inside and outside of this beautiful venue. What could be more magical than this stunning Georgian house surrounded by deep snow fir trees on its grounds dusted in white, completing the winter wonderland look? This gorgeous house with guest bedrooms could be exclusively yours for an awesome winter wedding. A Christmas winter wedding at the RSA House in Central London is a truly magical experience, and we think one of London’s best-kept secrets. The historic House combines Georgian splendour with high-quality contemporary design, and its stunning vaults can be exclusively hired and perfectly dressed for an intimate, romantic winter wedding. One Aldwych transforms into a winter wonderland during the cold and Christmassy months. Expect towering white Christmas trees and fairy lights with decorations complementing the contemporary interior of this beautiful Central London hotel. 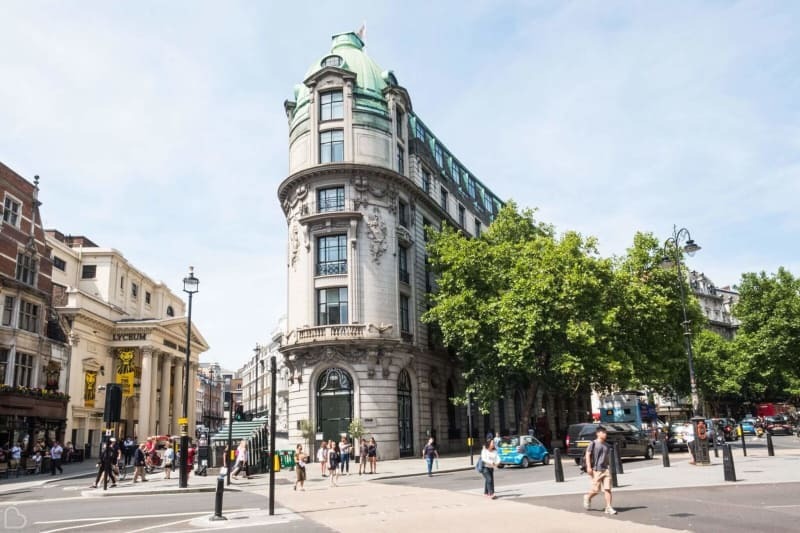 One Aldwych hotel offers full-package wedding services, and their team of professional will make sure your every need in met. Have the most magical winter wedding and wake up in Covent Garden the next day… What more could you want? If a cosy winter wedding by the sea is what you’re dreaming of, then East Quay at Whitstable Harbour could be the one you’re looking for. 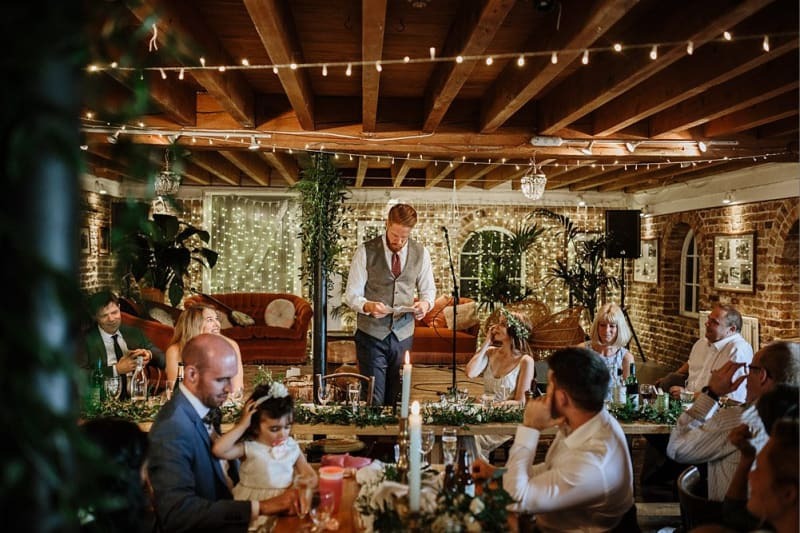 Situated on the east side of Whitstable harbour, this old Oyster house has been transformed into a relaxed but beautiful wedding venue which is just begging for a little-added winter sparkle. With friendly staff and undeniable character, East Quay is perfect for couples looking for unique winter wedding venues! These beautiful sandstone barns look simply beautiful during winter months. A cold calmness falls across the sparse fields in winter yet the barn glows with warmth and hums with activity. 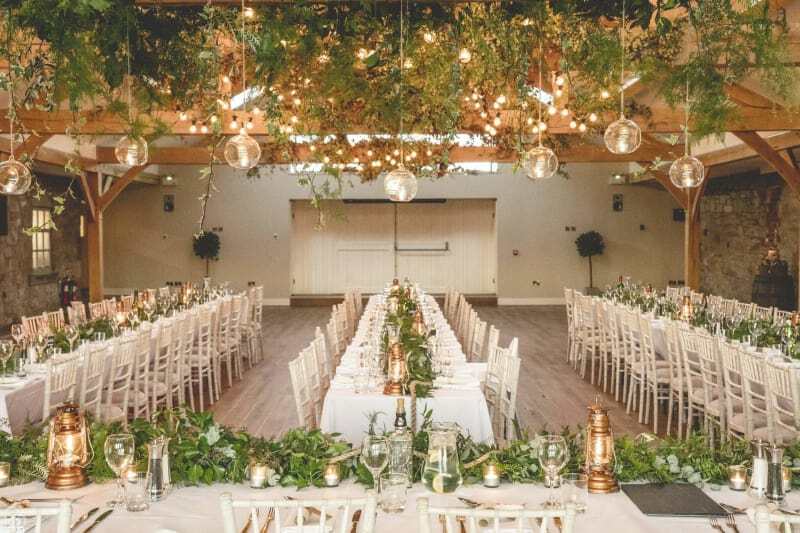 A perfect blend of contemporary chic and rustic charm, if you are looking for a wedding venue in Cheshire, this could be the perfect match for you. 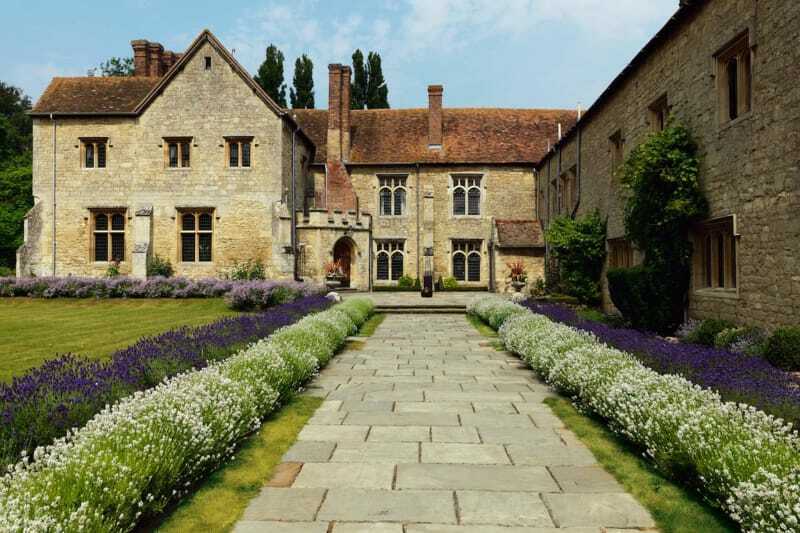 Winter weddings don’t get much more romantic than those held at Notley Abbey – an award-winning country house wedding venue in Buckinghamshire that exudes historic charm. The crisp, cold weather will make for stunning photographs both inside and outside of this beautiful venue. 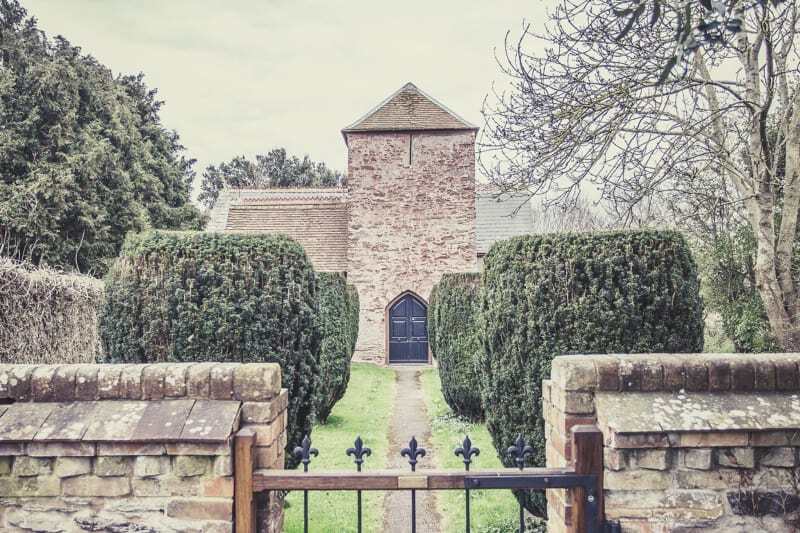 And if you need any more reasons to indulge in this fairy-tale venue, this was Laurence Olivier’s former home… Truly a historical place to tie the knot. 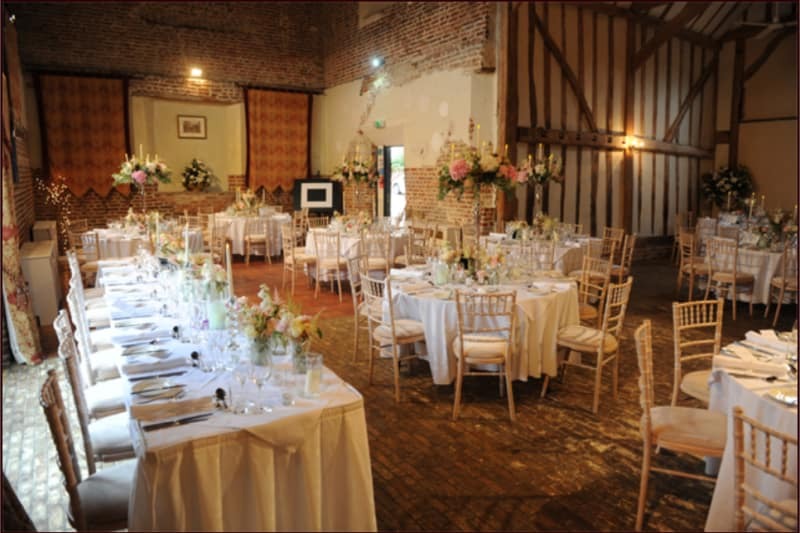 If you’re dreaming of a winter wedding in Essex, Leez Priory should be at the top of your venue shortlist. Think intimate weddings with open fires and twinkling lights, and you will be sure to get all that you’ve imagined if you chose to tie the knot in this gorgeous venue. 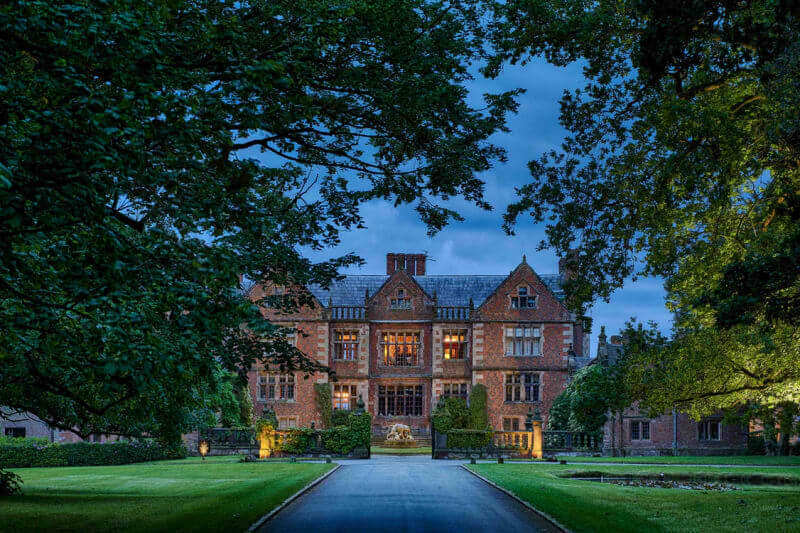 This magnificent, red brick Tudor mansion is set in stunning grounds and has been voted Wedding Ideas Magazines ‘Best Wedding Venue’ award a whopping three times. Think cosy weddings with open fires and twinkling lights. Elmore Court is a 750-year-old, grade II listed country house. Perfect for a classic English country winter wedding. With views of the Cotswolds and River Severn from its gardens, Elmore Court offers everything you could ever want from a wedding venue. And in winter, festive lighting and a sprinkling of snow are the only ingredients you’d need to add to achieve winter wedding perfection. 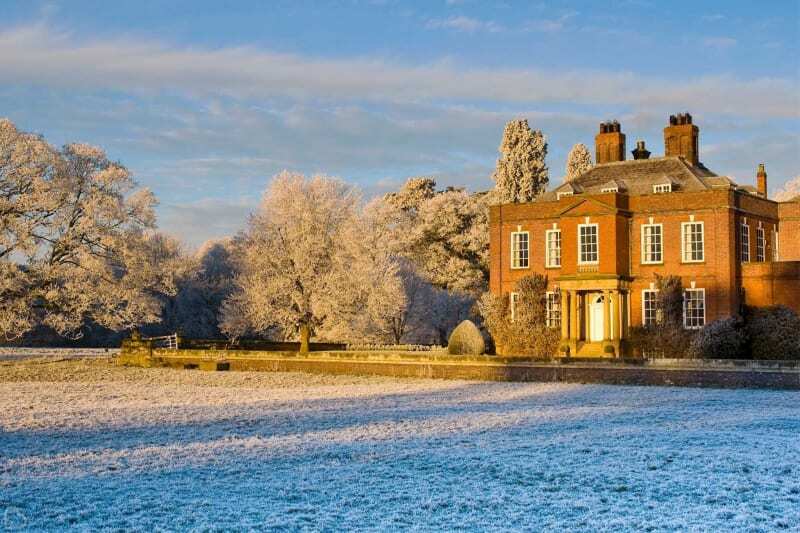 Surrounded by English countryside and landscaped gardens and filled with centuries-old history, Dorfold Hall is the perfect canvas for a winter wonderland wedding. Covered in a thin layer of snow during the coldest winter months, this 400-year-old historic hall will make your wedding photos look postcard perfect. Leave your guests absolutely speechless as walk into this fairy-tale scenery, with 1000-year-old oak trees, a lake and enchanting gardens! 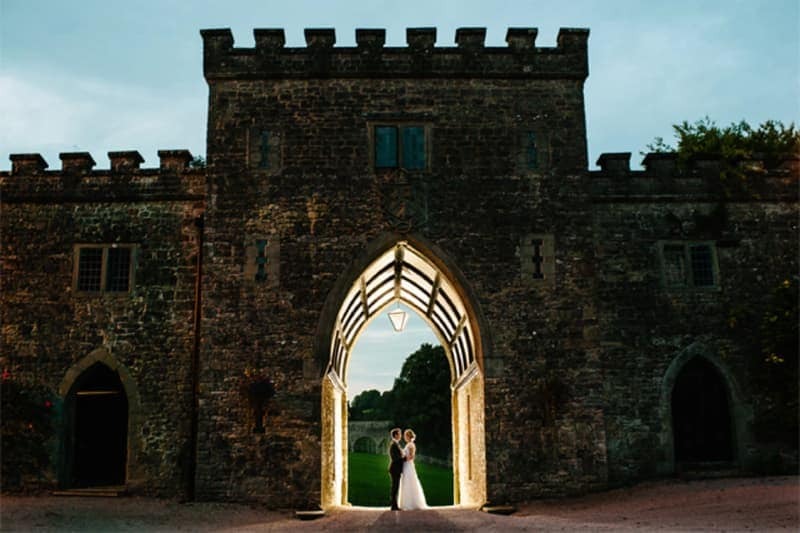 Hidden in an enchanting forest in the beautiful county of Gloucestershire is your dream winter wedding venue: Clearwell Castle. 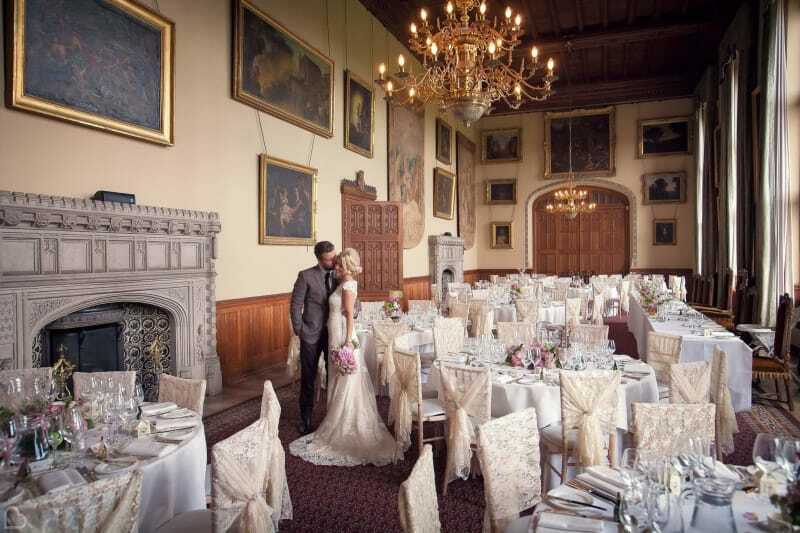 Only 45 minutes away from Bristol, this dreamlike castle is ideal for a winter wedding. Covered in a layer of white snow on the outside, and endlessly cosy on the inside, make your guests feel like they’re in a real-life Disney movie as you tie the knot with the love of your life. 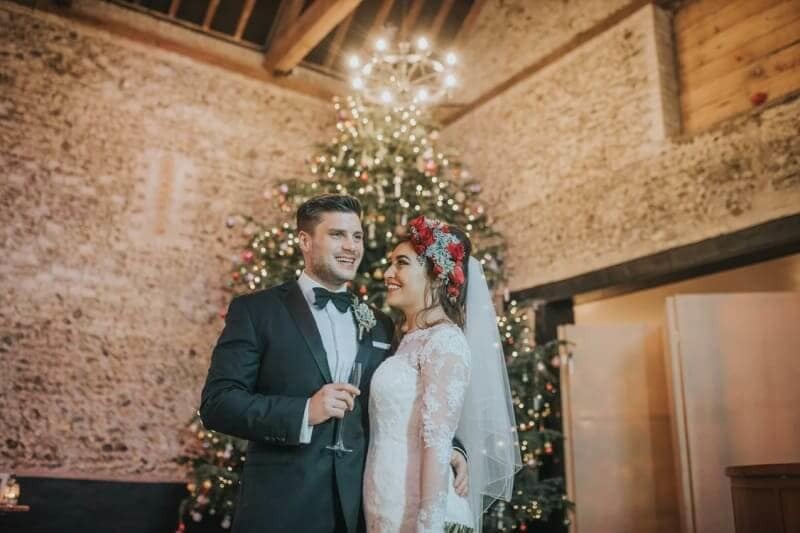 This 18th-century Granary Barn is the perfect choice for an intimate and relaxed winter wedding! 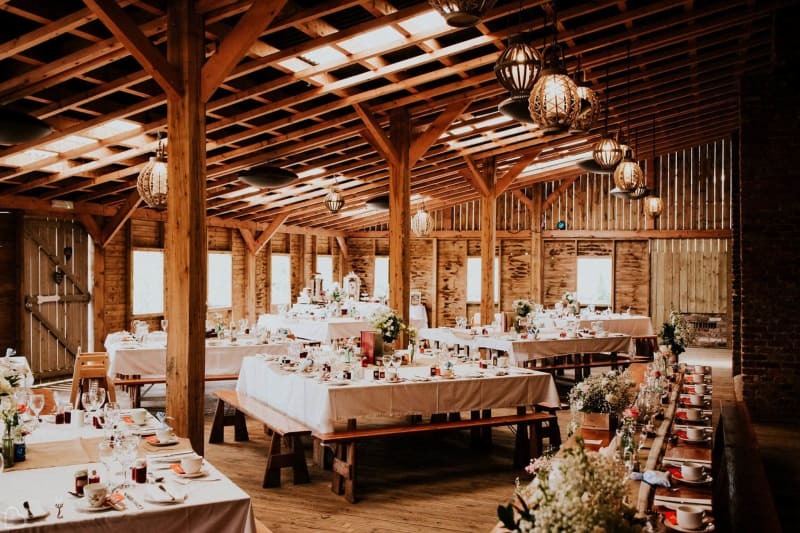 Cosy countryside barn meets elegance in this stunning wedding venue, ideal for the winter wedding you’ve been dreaming of. 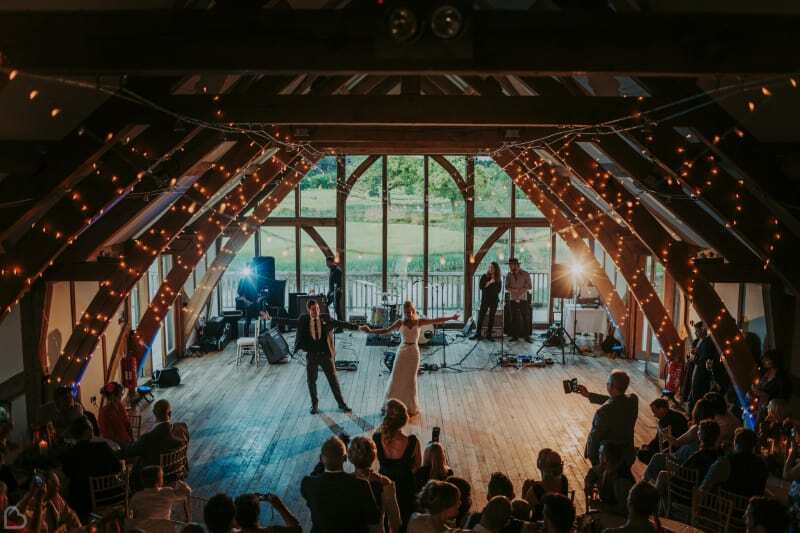 With two splendid barns linked by a glass walkway and boasting a private courtyard and an exceptional team of wedding professional helping make every one of your wishes come true, you can enjoy your wedding day to the fullest at Granary Estates! This imposing 18th Century manor house in Hampshire is a classic English wedding venue, which, with a touch of snow and some Christmas decorations, can become a splendid winter wedding venue. Look up at the stars from the reception space and dance the night away in a spacious venue decorated to your taste. This Hampshire venue is one of our favourite places to celebrate the most magical day of your life! Surrounded by beautiful 18th Century Parkland and stunning gardens, Iscoyd Park overlooks the borders of North Wales, Shropshire and Cheshire. 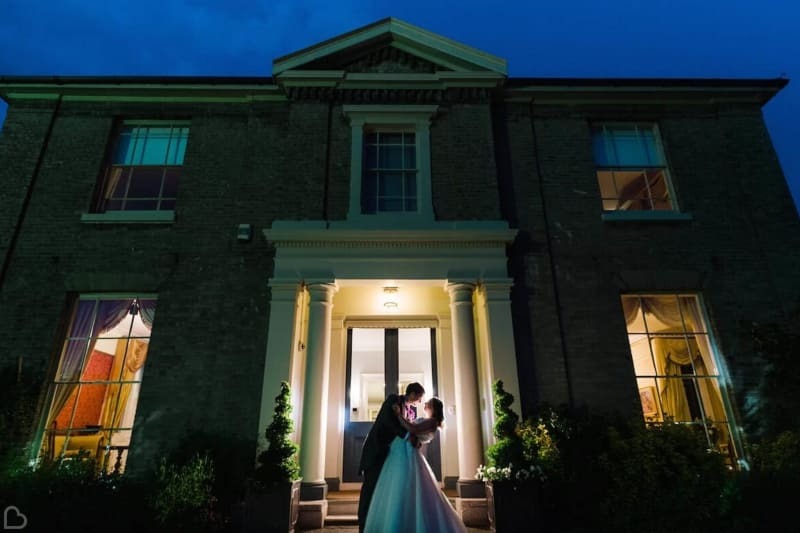 Though Iscoyd is an award-winning wedding venue, with enough space hold 160 people for a wedding reception, it has managed to retain the character, history and welcoming warmth of a family home. This makes Iscoyd a magical place to tie the knot and make your guests feel at home. Experience the dynamism at the heart of Edinburgh with a stunning backdrop of historic Calton Hill as you celebrate your wedding day! 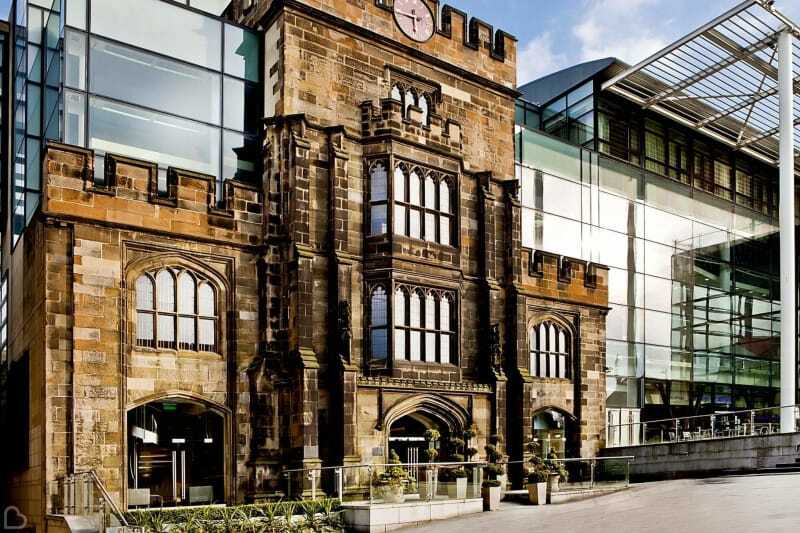 The Glasshouse Hotel is one of the best wedding venues in Scotland and covered in snow during the cold winter months it makes the perfect venue for a winter wedding. With a secret roof garden and an impressive 160-year old Georgian archway, this exciting venue will certainly wow your guests! 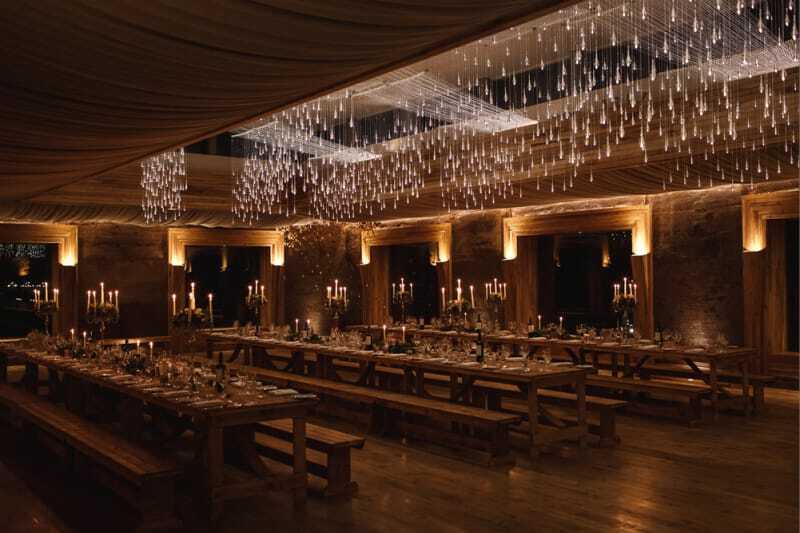 At the heart of coastal Northumberland lies this unique barn wedding venue, ideal for a winter wedding! Offering one to three-day wedding packages, Doxford Barns promises to create your dream wedding day, even if strays from the norms, in a stress-free manner, which is why it is absolutely perfect for a couple looking for a bespoke winter wedding. Oh, did we forget to mention that this private venue is smack in the middle of 550-acres of green fields? 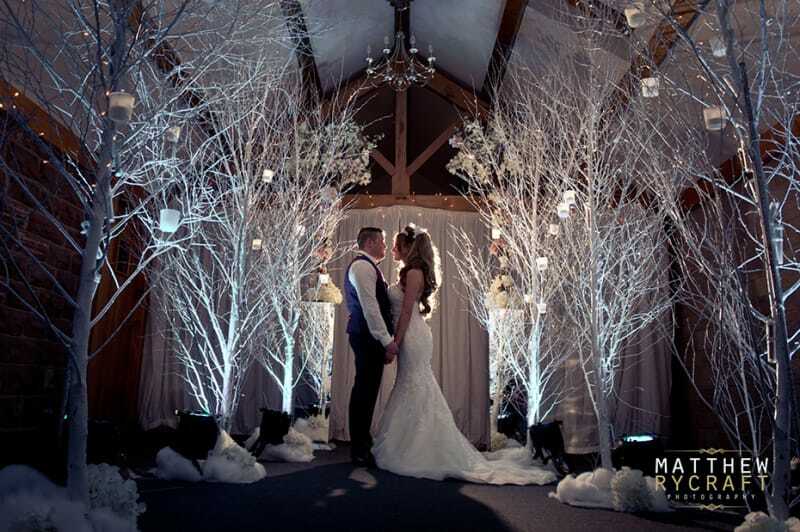 Book your dream winter wedding venue in Northumberland now! Imagine getting married to the love your life in a Sun Room overlooking the most beautiful gardens dusted with snow. At Greywalls this is possible! Your guests will be able to sip champagne as they stroll through the garden, and take in the views over the gardens and Muirfield golf course from the house. Create the perfect wedding atmosphere for you and your loved ones with bespoke packages from relaxed and intimate to formal and grand! 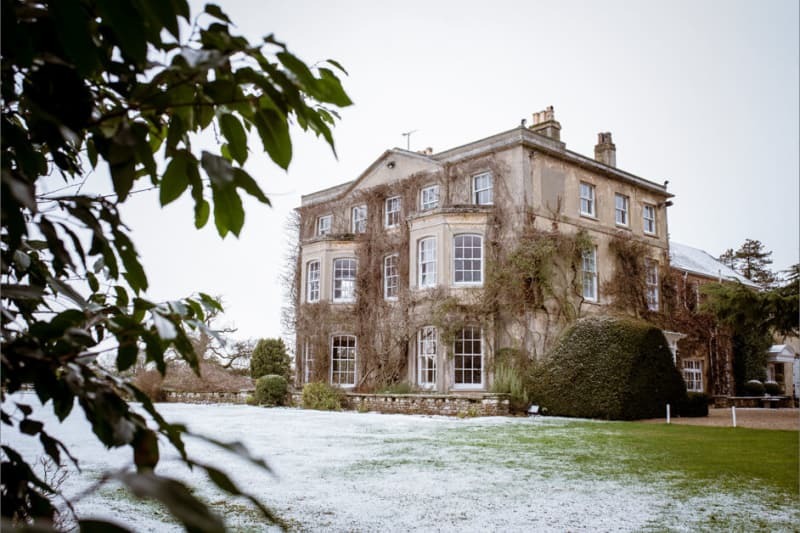 If you want to host a winter wedding in Somerset, this 13th Century Manor could be the one! Located in Somerset, this is one of the most charismatic wedding venues in the UK and it will make you and your guests feel right at home. You can wander around the parks and visit the duck ponds and the ponies or just cosy up next to a roaring fire in the library. Bespoke to you, the perfect winter atmosphere awaits at Maunsel House! This storybook winter wedding venue will be even more romantic when surrounded by a generous blanket of snow. 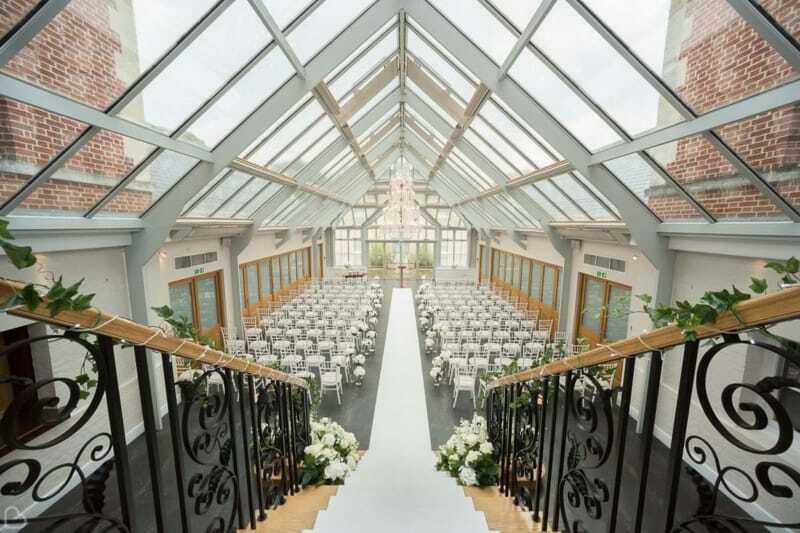 With its Georgian style architecture, high ceilings and beautifully landscaped gardens you’ll be able to have the wedding you always dreamed of! The venue is can host grand and intimate celebrations and they have a number of beautiful spots where you can tie the knot! What are you waiting for? Book your Somerset wedding venue! Have the most unforgettable picture-perfect day at this grand country hall, set Northeast of the historic town of York! Sandburn Hall is surrounded by an expansive golf course, fit with lakes and beautiful gardens which will look even more gorgeous covered in snow. The team will help you craft the perfect wedding day with all the special touches that will make it your own. No matter how unique you want it, have your dream winter wedding at this fantastic venue! Nestled in the heart of the Cambridgeshire countryside, lied one of the most enchanted venues on this list. 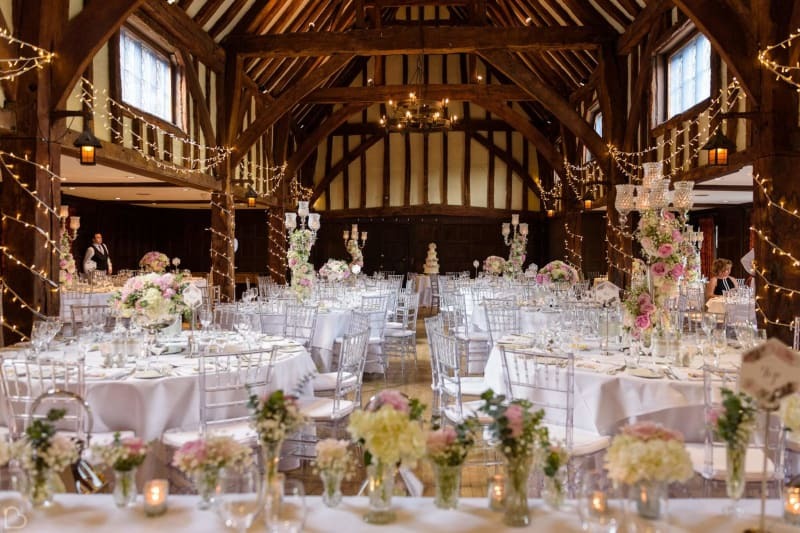 Travel to Royston and discover South Farm, a restored Grade II house, gorgeous Tudor barn and summerhouse, ready to be the perfect setting for your winter wedding. How could we not rhyme when we think of such a romantic place to tie the knot? Find out more about South Farm here! 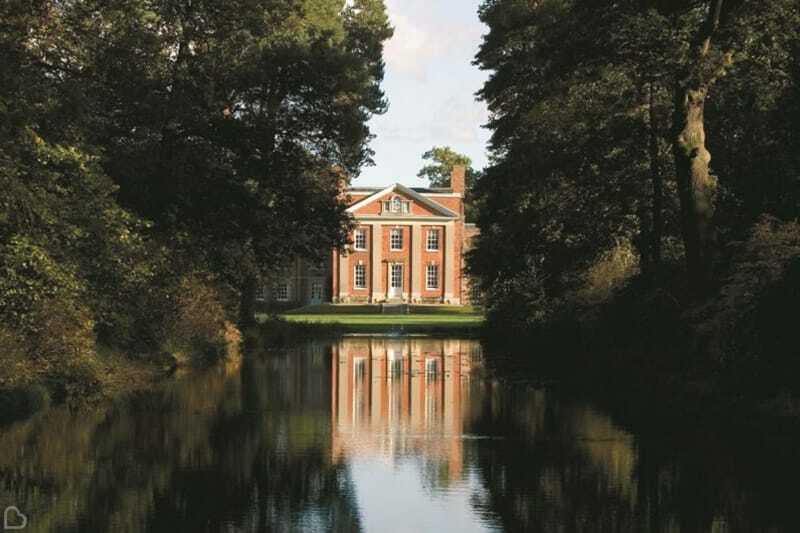 If you are looking for a wedding venue that will surprise your guests, Warbrook House the perfect host. With stunning details, such as a Versailles style canal, beautiful gardens and breath-taking architecture, this stunning Hampshire wedding venue is simply perfect for a winter wedding. Fit intimate or grand occasions, the Warbrook House team will cater to your needs and make you feel comfortable as you plan your wedding in this dream location. 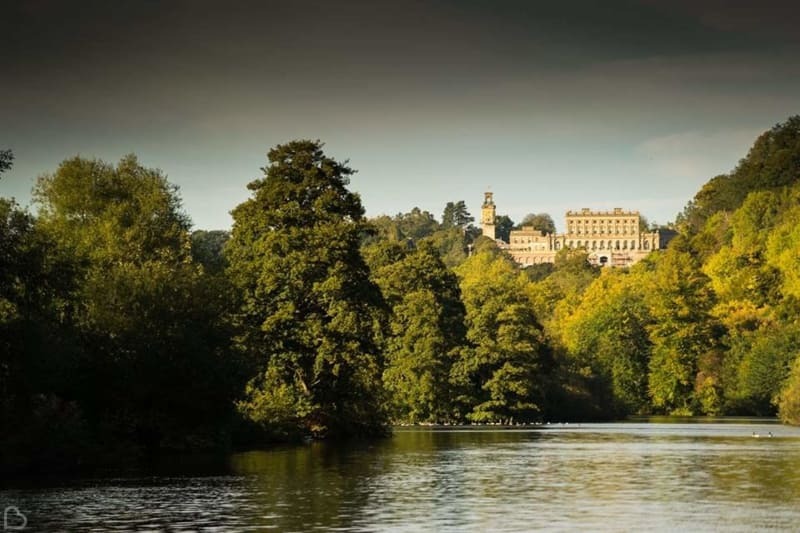 Smack in the middle of Berkshire, overlooking the River Thames, likes Cliveden House, one of the most romantic venues on this list. Cliveden offers excellent food, service and hospitality, in a sophisticated country house hotel which has been known for its excellent entertainment for over 300 years! Imagine this beauty lightly sprinkled with white snow and you have the winter wedding you always dreamed of! This Yorkshire wedding venue is the ideal for a rural winter wedding! 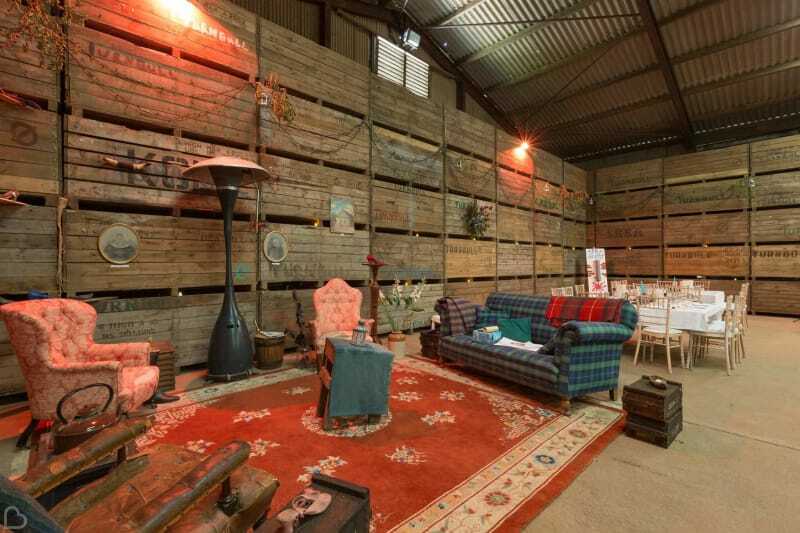 Perfect for a less formal wedding, this visitor attraction can be closed just for you and return to its natural farmstead state! Located south of York this venue is beautiful inside and out! No matter how bespoke you want it, the team will make sure everything looks perfect for you and your guests on your special day! Surrounded by 250 acres of stunning gardens, you and your guests will be able to enjoy the exclusive use of the Carton Towers for your wedding day. With an impeccable reputation of hosting weddings for over 30 years, this Victorian-gothic style country house will look like a fairy-tale castle covered in white for your winter wedding! 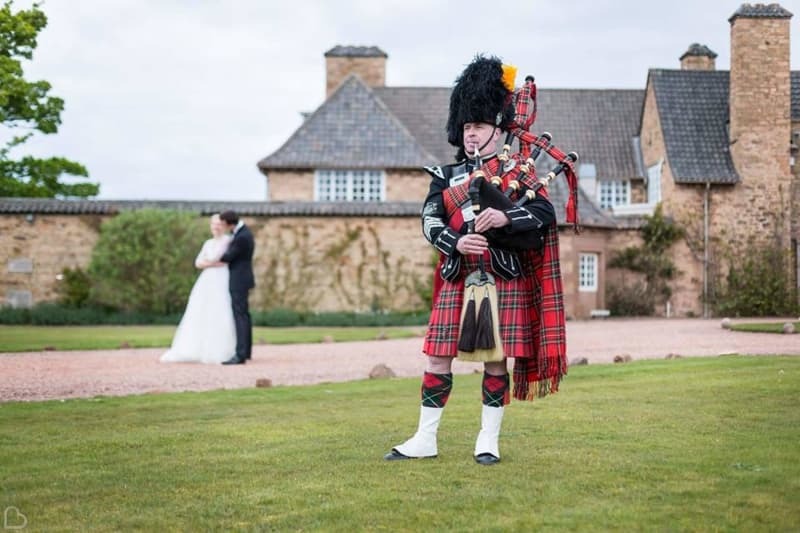 One of the most beautiful wedding venues in Scotland makes it on our list! Imagine this beauty covered in white snow and you have the winder wedding from a fairy tale book. From an intimate ceremony to a full-blown house party, Cambo Estate is flexible and offers wedding parties bespoke to you. If you are looking for a venue that won’t tell you how your wedding should be, this could be the one! Set in 50 acres of enchanted gardens, this 16th-century Elizabethan house is the perfect setting for a rustic winter wedding! Want to have a picture-perfect day that you can look back on and be proud of? Step into the breath-taking gardens of Great Fosters and discover lakes, sunken rose gardens and endless natural beauty! What are you waiting for? 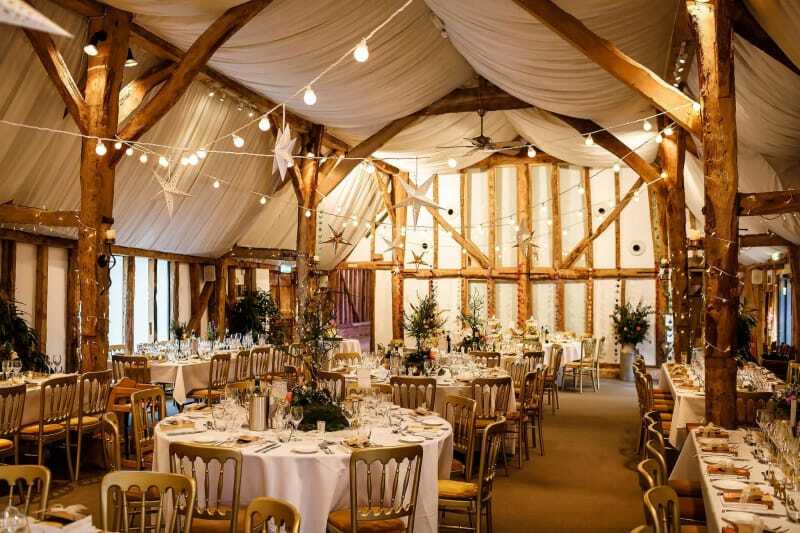 Book your Surrey winter wedding venue today! Only a 30-minute drive from London, set amid 56 acres of rolling Surrey parkland, you will find this magnificent country house venue, which marries history with the absolute best in modern style! This breath-taking mansion looks incredibly gorgeous when it snows, create a dream-like backdrop for your special day. Your guests will be wowed by the beautiful outdoors and indoors of Botleys Mansion, and the team will make sure everything runs like clockwork on the day! 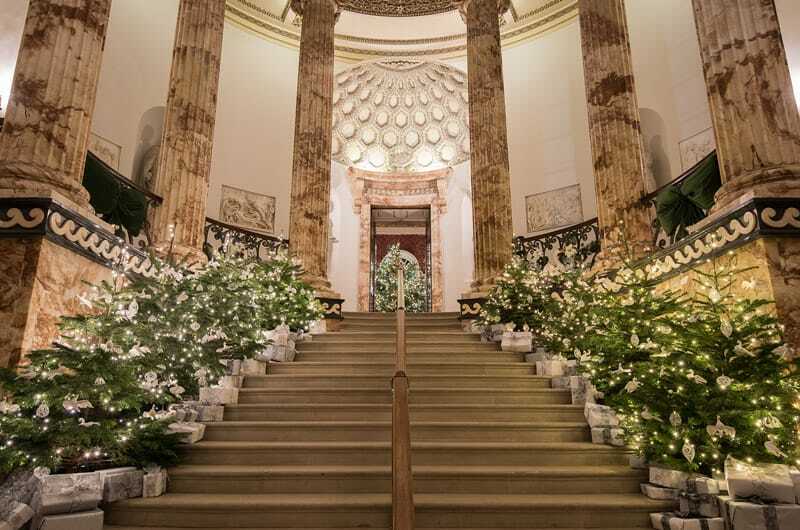 Just minutes away from the iconic St. Paul’s Cathedral you will find this beautiful hall and its secret garden, where you and your loved ones can celebrate your wedding day! 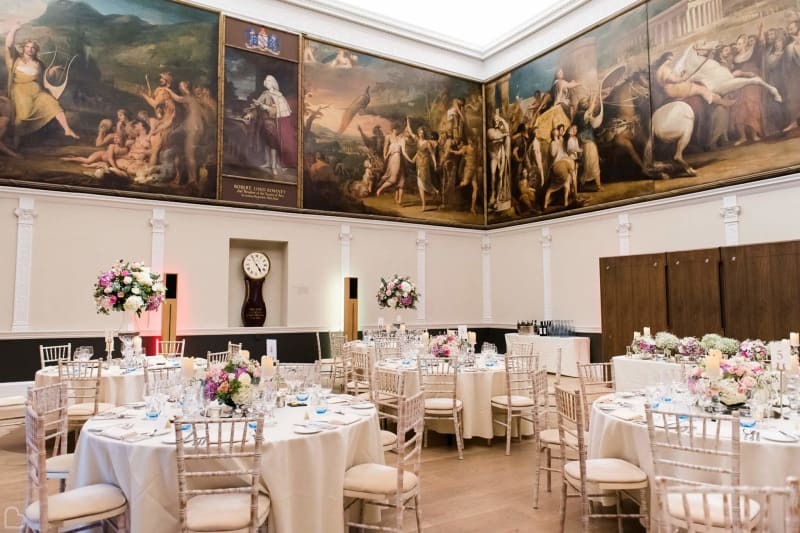 This venue is ideal for anyone having a winter wedding in London, and looking for something cosy yet grand to throw the party! You can host over 200 guests if you’re throwing a big party, or under 100 guests if your wedding in the intimate kind. 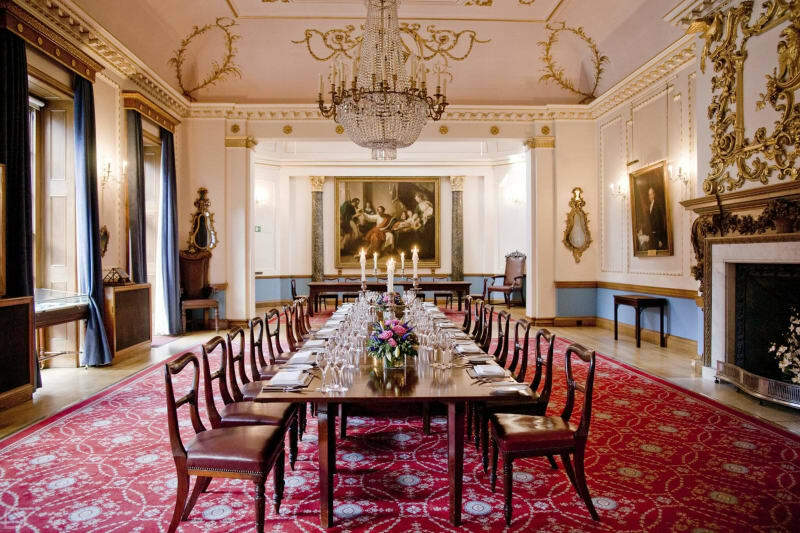 The options are endless at Stationer’s Hall, and we couldn’t recommend them more for your winter wedding! Are you dreaming of a white wedding? If you’re considering getting married in the UK in winter, contact these incredible winter wedding venues for more information or to arrange a visit. To search for more wedding venues near you, why not enlist the help of Bridebook – your online wedding planner complete with free, supplier search tools. Discover our state of the art wedding venue search and make sure you can afford your dream wedding with Bridebook’s wedding budget planner! All of this and more, on your desktop or on our free Bridebook mobile app.